In this blog post, I am going back to basic. Meaning, I want to write about how a DIY electric car works. A simple explanation of how all the components work together to become an electric vehicle (EV). You call call it an “elevator pitch” or a summary. Just like in any DIY electric vehicle, it began its life as a normal gasoline driven car with an [tag-tec]internal combustion engine[/tag-tec] (ICE) power plant. During the EV conversion, the car goes through a major “heart transplant”. 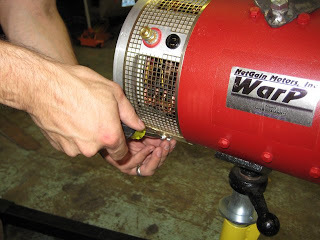 We are removing the ICE and replacing it with a DC electric motor. Next, it’s the removal of non essential parts. Every components that used to be connected to the engine is now redundant and to be taken out. Parts such as the exhaust pipe, muffler, catalytic converter, fuel tank, fuel pump, radiator etc are to be removed. There is one crucial component that you must keep intact, the transmission unit. To move the EV, torque will be generated by the electric motor. To transfer the power into the wheels, the motor has to be connected to the existing transmission unit via an adapter plate. How do we control the electric motor? That is where the electric motor controller comes into place. Here’s how it works. The car accelerator paddle is connected to a potential meter. The meter will control the flow of electricity into the motor. When you floor the paddle, the potential meter will tell the electric controller to increase the voltage into the motor, therefore spinning it faster and accelerating the car. Where do we get the electricity to power the EV? From DC batteries. An average sedan electric car will need 10 – 15 units of lead acid batteries. On a full charge, it will give approximately 150 driving miles. The actual drive mileage of a DIY electric car will depend on the motor power rating, charging state of the batteries, weight of the car and also the driving condition. In a nutshell, that is how a home made electric car works. If you want to know more on how DIY electric car works, check out Gavin Shoebridge’s Electric Conversion Made Easy e-book. The e-book comes with a series of 11 High Definition (HD) instructional videos.